Rear seat installed in front on passenger side? I have a new project in my workshop. it is a February 1942 Willys. 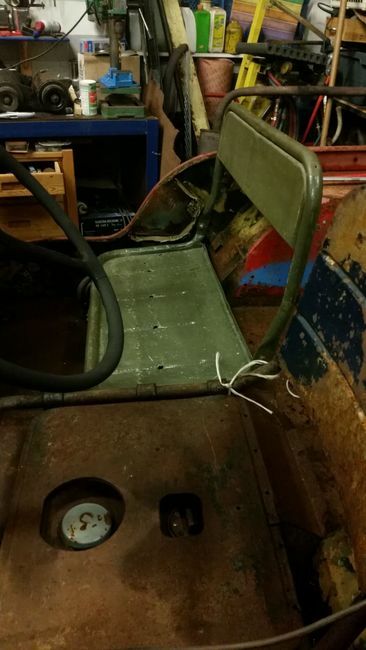 It seems that at one point in time the rear seat was installed at the front, where otherwise the pasenger seat would be. THe way it was done, it seems this was done early in the Jeep's life. 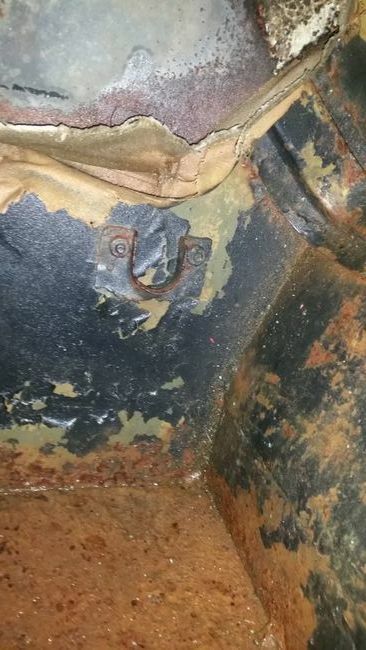 The bracket for the lower tube of the seat at the rear under the tool box lock was cut out, rivet holes welded shut, and the part was moved and bolted to the body side in the front under the crash pad. Also, to hold the foldable back of the seat, a stopper was bolted to the side. See pictures below. The rear seat fits just fine. No idea how the left side would have been supportet. 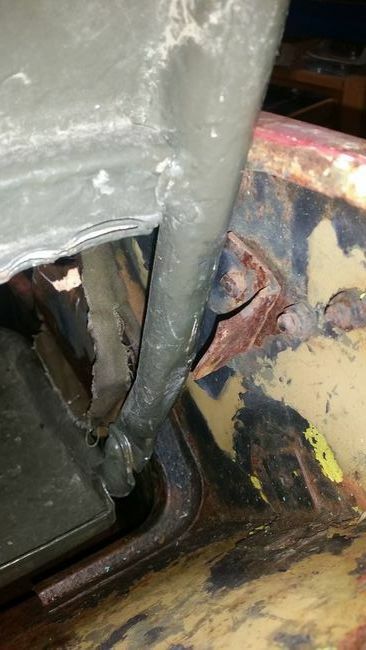 No obvious holes there, the rear tube bracket on the driver side is still present in the back. Now, is anyone aware of a wartime picture / record of such a modification? Anyone found similar arrangements in a Jeep? Re: Rear seat installed in front on passenger side? Maybe it was done for one of those USO tours to haul Marilyn Monroe and Bob Hope around. Wouldn't that be cool. So far I only found one picture! ...and like in my case, all holes for grab handles and top bow brackets welded shut! 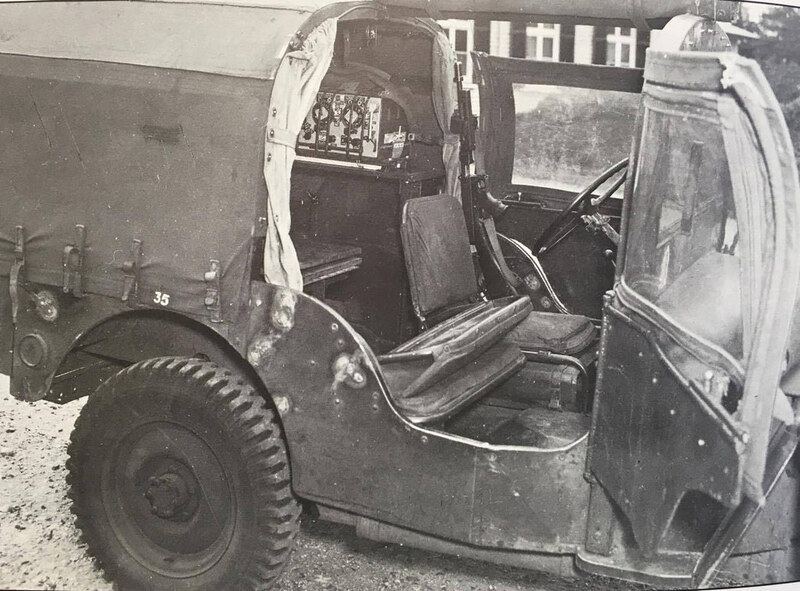 I was going to offer up it may have not been the whole rear seat in there, they may have shortened it width wise to create a quasi folding front jump seat that was easier to remove and gain entry (radios) than clamoring over the folded forward seat. Just a thought. But then why not just turn the original seat around with back against the dash. Neat photo of the Canadian mod though. Unaltered rear seat just fits nicely. Great to see that you have a new project back on the G !! Great picture, and love the Tommy Gun there as well ! You may have the very same jeep, that would be a first I think of finding an actual pic of your jeep during WW2 !! Any other strange holes, or such on the wheel wells ? Look for any original unit markings under the paint. Is yours a Canadian jeep as well ? My dads 44 GPW was done the same way. I will ask him if he remembers if he did it or if he got the jeep that way.